Current flowing on a conductor through the hole in a toroidal core give rise to magnetic flux in space surrounding the conductor, including the core. If the core material is of high permeability, almost all of the flux that is created is within the core material. If the conductor is taken around the core and through the hole again in the same direction as the first, the flux in the core doubles due to the magnetising force of the current flowing in the second pass through the core. The flux due to the rest of the additional ‘turn’ is insignificant, the part of the turn outside the core does not produce significant flux in the core, nor is its flux significant compared to the flux in the high permeability core. So, the number of ‘turns’ of a conductor wound on a high permeability toroidal core is the number of passes through the core in the same direction. There are no half turns, when you see someone describe a winding as having half turns, they don’t know what they are talking about, or are perhaps suggesting a physical layout, but the number of electrical turns is always a whole number. Inductance of a coil on a toroidal high permeability core is proportional to turns squared, so is very sensitive to winding the correct number of turns. 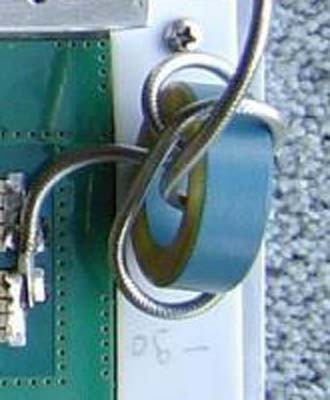 Above is a current balun that is interesting. The designer thought it had three turns, but look closely, there are two passes in one direction, and one in the opposite direction, so the net number of turns is one, the inductance of this choke is about 11% of the designer’s intention. The effective number of turns is the net passes of current carrying conductor through the hole in the same direction. For lower permeability cores, because the flux in the core is lower, there is a significant portion of the total flux outside the core, so the situation is not as clear as with a high permeability core. However, you won’t go far wrong if you apply the case for high permeability cores more generally. Above is another example, enlightenment from a QRZ 'expert', W5DXP who wrote on 22/08/11 ... I discovered that Amidon's published choking value for "one turn" through a ferrite bead is actually for two wires passing through the bead. Here's what Amidon means by "one turn" offering the picture above. Of course, he is quite wrong that the picture depicts one turn, he has probably measured incorrectly, not accounted for the fact that Z depends on frequency, or has been supplied the wrong cores. Go back to the fundamentals, the flux in the high permeability toroidal core is a result of the magnetomotive force due to the current flowing through the hole in the core, and the magnetomotive force is measured in Amperes. Obviously if a conductor carrying some current I is passed through the core again, then if the current is in phase with the first pass (as it will be if the wire length is small relative to wavelength) then it reinforces and the total magnetomotive force is 2I. There is also flux around the wire, external to the toroidal core, but if the core is of high permeability, the external flux is relatively very small and can usually be ignored.